Cattery is registred in WCF(Germany). At the moment we have a new litter of Sphynx kittens, rare colourings. Mom is – Baltic InterChampion (ICH), Dad - Grand International champion (GICH). You can already make reservation of kitten. Here you can get expert advice on the purchase and maintenance of a kitten. 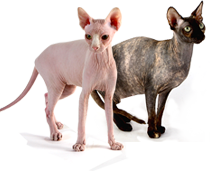 Canadian Sphynx kittens will be ready to move into a new home after the New Year (just after You will take Christmas tree with all the decorations away from the house). All kittens are vaccinated, accustomed to scratching, are accustomed to use the toilet and, most important, socially adapted. Here you can get expert advice on the purchase and maintenance of a kitten.